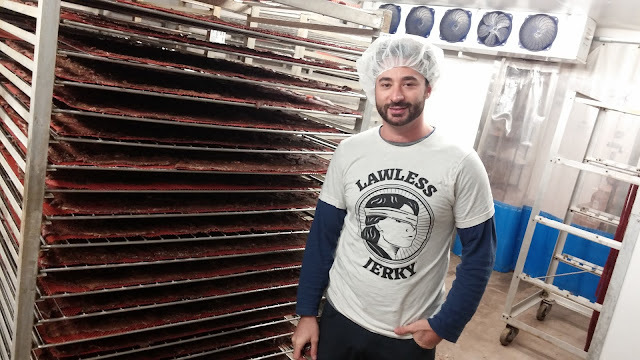 Matt is Lawless Jerky’s Founder and Jerky Chef. He was a jerky hobbyist, experimenting with interesting recipes for himself and his friends, until he came to the realization that his job practicing LAW was making him LESS happy. He was certain he could contribute more to the world with his jerky than his lawyering. Matt launched Lawless Jerky with a Kickstarter on the day of his 30th birthday … and the rest is history. 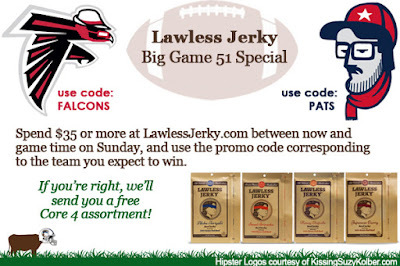 Almost 4 years later, Lawless Jerky is available in 4,000 stores in the US and Canada along with a bustling online business. Enjoy the following tips for making your own jerky at home, and sample his greatest hits at LawlessJerky.com. 1) Choice of Meat: One of the great things about home dehydrating is that you can use any meat that you want. So if you're looking to try an exotic meat (e.g. duck, goat, elk, venison, etc.) or just a different cut of a more common protein (e.g. beef brisket, chicken thighs), the world is your oyster! 2) Slicing the Meat: If (like most people) you don't have a meat slicer, you can get a thinner slice on your meat (and thus more surface area to marinade, and a quicker cook) by slicing the meat while it is still partially frozen. 3) Making a Marinade: In my early days, I'd start with a base marinade or sauce and then supplement it with salts, sugars, spices, and other sauces/vinegars. Once you're comfortable with building a nice jerky marinade from a base sauce/marinade, you can move towards building your marinade completely from scratch. 4) Calibrating your Marinade: Make your marinade stronger (more intense) than you would for grilled meats. The marinade's intensity will dissipate some during the drying process. 5) Marination: Marinate the jerky at least overnight, ensuring that the marinade is evenly distributed over each piece. If marinating in plasticware, shake the mixture rigorously during the marination process to simulate the tumblers that we use at our facility. 6) Rotating Trays During the Cook: No matter the style of your home dehydrator, there are probably multiple trays. When full, the top trays (if you're using a Nesco dehydrator for example) or the back of EACH tray (if you're using an Excalibur or Weston) should be rotated during the cook process to ensure an even cook. With a Nesco, swap your bottom two trays with your top two trays halfway into your cook and as needed throughout to control the consistent drying of your jerky. For "heat-element-in-the-back" units, simply rotate each tray in its slot 180 degrees, or two turns. 7) When to Pull the Jerky” Just like other cooked meats, deciding when the jerky is "done" is a matter of taste. To experiment with different levels of doneness, you can either cook meat sliced into different thicknesses for the same amount of time or cook meat of a uniform thickness for different amounts of time. Remember that the jerky will continue to cook and harden once it's pulled from the dehydrator, so account for that extra hardening when deciding when to pull it! 8) Bagging the Jerky: Make sure to let the jerky fully cool before bagging so that evaporated moisture (an enemy of jerky preservation) doesn't accumulate inside of your bag/container. 9) Cleaning Up: Whether dehydrating in a dehydrator or a home oven, if you're using a wet marinade, make sure to line the bottom of your unit with towels/paper towels to catch the drip of the marinade and to make for easy cleaning. Cleaning a Nesco is pretty easy but a stainless steel Weston definitely benefits from a bottom catch layer, or drip tray. 10) Jerky Shelf Life: One of the nice things about home jerky is that you can get a level of freshness that is impossible for commercial jerky to achieve. Like eating fresh cookies out of the oven! Also, as a home jerky maker, you aren't constrained (by law) by the moisture content of the final product, so you can have a moister jerky product than you could ever find in stores.